14 day FREE fully functional evaluation. Enjoy seeing your images in File Explorer now! This is the Trial and Full version. Unlock all features with a licensed key. Whilst in trial mode, thumbnails will have a MysticThumbs watermark on the top right. This serves as a trial indicator and a reminder of how useful this tool is. Install and updates require Administrator privileges. MysticThumbs is signed using a Microsoft® Authenticode® Certificate. This ensures the software is legitimate and has not been tampered with. 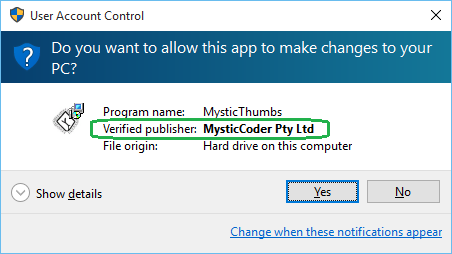 Download only from MysticCoder.net and be sure you receive the blue User Account Control security prompt with Verified Publisher 'MysticCoder Pty Ltd' when installing. Do not install if you have received from a third party source and receive an orange unknown publisher warning. In this case the software has been tampered with and will likely contain malware or viruses. Install only from this web site. Proceed to the store to purchase your fully licensed copy of MysticThumbs.